This is week two/part two of our series, “The Virtuous Life of a Christ-Centered Wife.” For previous posts, please see the links at the bottom of this article. 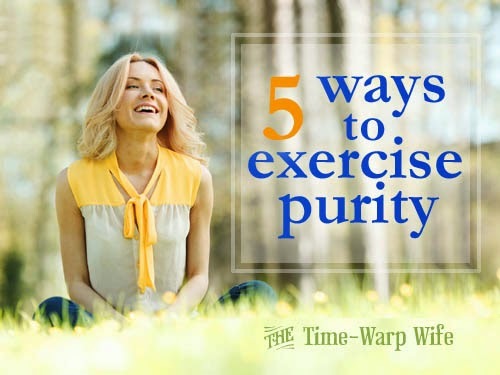 Another name for the virtue of purity is “pure in heart.” To be pure in heart means to have good intentions. The opposite of that would be doing things merely because we feel obligated to, or doing one thing while thinking another, otherwise labelled a hypocrite. As far as I was concerned, I was a good girl. I held my tongue. I didn’t shake things up like I could have. I never would. I’m too kind for that type of behavior. Ouch. That comment stung, but his words rang true and I knew it. I had just spent ten minutes ragging on about this person and saying how much they got on my nerves. I hadn’t stopped to consider that my thoughts were every bit as guilty as someone’s actions could be. I’m timid, and I’m shy, but I’m every bit as guilty as the next when it comes to my thoughts. God searches the heart, He sees the ugly parts that I tuck away from the world. This is why it’s important to consider my thoughts as much as I do my actions. Are they reflecting the love of Christ? Or do they reflect a self-centered impatient heart? A pure heart is one that is centered on Christ. 1. Consider your words. This includes swearing, lying, gossiping, yelling, and bragging. Are you seeking to edify others? Is your conduct in-line with God’s will? If it isn’t, practice stopping yourself the moment it comes out of your mouth and correct your behavior. 2. Consider your love. Do you love to get love? Is the love you have toward your husband and God conditional? In other words will you love them just as much tomorrow if things don’t go your way? When love becomes just a matter of give and take we discover that some days we can’t give because we haven’t been given enough. Our love tank is empty. But if we love others simply because God loved us, we always have our love tanks full by His Spirit, overflowing and ready to pour out on others. Timothy Keller writes, “Without the help of the Spirit, without a continual refilling of your soul’s tank with the glory and love of the Lord, such submission to the interests of the other is virtually impossible to accomplish for any length of time without becoming resentful.” The Meaning of Marriage: Facing the Complexities of Commitment With the Wisdom of God. 3. Consider your actions. Are you serving others joyfully or grudgingly? A virtuous woman understands that her final reward comes from the Lord.